Kitchens are the heart of the home and should be designed for your lifestyle. Our expert designers and skilled craftsmen will install your kitchen to perfection. We put it all together from inspiration and design to installation and customer satisfaction. Your bathroom should be something you love and enjoy every day, and having the right design and installation will make all the difference. 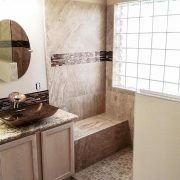 Our designs and quality installations will give you lasting beauty and a bathroom you will love. RETRO PRO IS YOUR KITCHEN AND BATHROOM REMODELER FOR LIFE! Your kitchen is the soul of the home, a place where relationships are nurtured and memories are made. We can create a custom space that adds style and functionality , and is perfectly designed for you! 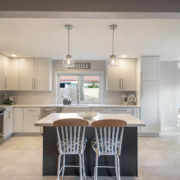 We have a state of the art rendering program which allows you to see your kitchen creation before your remodel starts. See some of our projects for inspiration. ​A bathroom​ ​should​ ​enhance​ ​the​ ​soul​ ​of​ ​your​ ​home​ ​and​ ​be​ ​a​ ​place​ ​which​ ​reflects​ ​your​ ​personality​ ​and​ ​fulfills​ ​your needs.​ ​Our​ ​Retro​ ​Pro​ ​designers​ ​will​ ​take​ ​the​ ​time​ ​to​ ​listen​ ​to​ ​your​ ​needs,​ ​expectations,​ ​and​ ​ideas,​ ​while helping​ ​you​ ​navigate​ ​through​ ​the​ ​decision​ ​making​ ​process. ​If​ you’re​ ​thinking​ ​about​ ​replacement​ ​windows​ ​or​ ​doors,​ ​there’s​ ​no​ ​reason​ ​to​ ​wait.​ ​The benefits​ ​start​ ​immediately.​ ​From​ ​enhancing​ ​your​ ​home’s​ ​interior​ ​to​ ​adding​ ​to​ ​its​ ​curb​ ​appeal,​ ​new​ ​windows​ ​and doors can transform your home. We​ ​have​ ​successfully​ ​completed​ ​many​ ​interior​ ​and​ ​exterior​ ​whole​ ​home​ ​remodels​ ​and​ ​additions. ​From​ ​architects and​ ​engineers,​ ​to​ ​designers​ ​and​ ​craftsmen,​ ​we​ ​will​ ​put​ ​together​ ​the​ ​perfect​ ​team​ ​to​ ​complete​ ​your​ ​project. OUR UNIQUE PROCESS USES THE SIX SIGMA SYSTEM TO ENSURE EXCELLENCE! Six sigma is a data-driven management system that’s aimed at creating process and product excellence by eliminating errors, waste, redundancy and time while enhancing customer satisfaction. This system improves the quality of services produced by the business through the removal of defects and errors. The system involves creating groups of people within the organization who have expert status in various methods, and then each project is carried out according to a set of steps in an effort to create excellence! Retro Pro offers creative design as well as professional and expert installation. Click​ ​below​ ​to​ ​see​ ​more​ ​about​ ​our​ ​remodeling​ ​process. 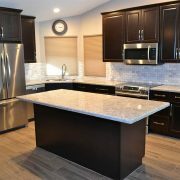 We encourage you to check out our projects galleries and view the kitchen design and bathroom design remodeling work we have completed. These photo galleries can serve as inspiration for your own home and give you an idea of what we are capable of achieving. 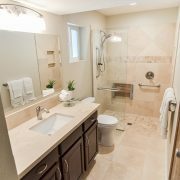 We offer kitchen remodeling and bathroom remodeling to all homeowners in Mesa, Phoenix, Ahwatukee, Scottsdale, Tempe, Gilbert, Chandler, Queen Creek, Paradise Valley and the surrounding communities. We can also help with your bar, home office, and home entertainment spaces. Contact us to start working with our team today! 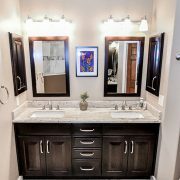 We used Retro Pro for a guest bath remodel in 2013 and were so pleased that we used them again for the master bath and, as before, we were really satisfied with the results and the whole process. Eric and Angela met with us initially at our home and then again for a design consultation at their showroom. Angela was very helpful both in the design process and during the construction. 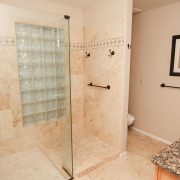 The work encompassed a total tear out of the existing bathroom, removal of a sunken tub, and a dividing wall. Two narrow windows were replaced with a single window involving the reworking of the stucco exterior. A new bathtub, tile surround, tile floor, new lighting, and cabinets were installed. Nestor, our project manager, and the crew were professional, competent, very accommodating and polite. Eddie did a great job with the tile work as he had done for the guest bath. It is nice to see a lot of the faces that were with the company four years ago. Communication was excellent and the project was finished on schedule. Although they are not the cheapest in town, the quality and peace of mind were well worth it and we highly recommend them. Our bathroom is now a showpiece! It came out better than we expected & we can’t say enough awesome things about our Retro Pro experience & the entire staff. We’ve already recommended them to a few friends. 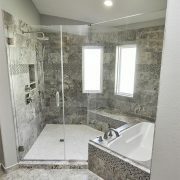 We recently completed a master bathroom remodel with Retro Pro. We are extremely pleased with our new bathroom! The entire team is professional and fun to work with. We definitely will use this company for any future remodel projects!! 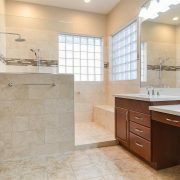 I hired Retro Pro to remodel my guest bathroom after interviewing 4 companies. Their pricing was similar to 2 others, but not the lowest. From the first contact through the final walk-through, Angela and Eric were extremely professional and easy to work with. Nestor did exceptional work, kept me informed of progress and what to expect, and even perfectly matched the wall texture in the adjoining den. 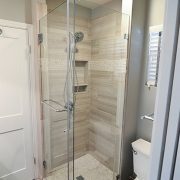 They started my project when they said they would, finished in less time than expected, and kept on-budget, which was remarkable considering it was the original bathroom for our 1950s house. I love my new guest bathroom and I highly recommend Retro Pro. They will certainly get any of our future remodeling business. 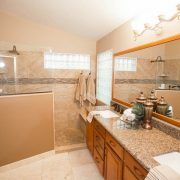 Previously had two bathrooms renovated by Retro Pro. This time we moved out for renovation of entire interior: all new floors, baseboards, ceilings, crown molding, painting. Great results, house looks like new. The team did a super job, worked extra hard, and enabled us to move back in earlier than the quoted time! Throughout the process, Nestor was outstanding at communicating and either he or Steve was immediately responsive if we had a question. They estimated 5 week, hoping to finish in 4. They finished in exactly 4 weeks and we are enjoying our amazing bathroom. Nestor and every member of the crew was respectful, hard-working, and clearly wanted to make sure things were done right. Having a major project ongoing in your home can be stressful, but they did everything in their power to make it as stress free as possible. 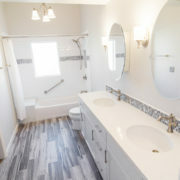 We have thoroughly enjoyed our new bathroom and highly recommend Retro Pro to anyone looking for a kitchen or bath remodel — a great job and great value. Our only regret is that we did not call them before our other remodels. I just finished our second major project with this company. I could not ask for better results. Workmanship, reliability, design help, communication….all exceptional. I strongly recommend Retro Pro. Amazing job! They were very good at helping from design, through the work process and end of total kitchen remodel. Their work crews are professional and trustworthy. I couldn’t have asked for a better company for this project. And even when the beautiful kitchen was done they are there when I call with any questions. I highly recommend Retro Pro. We had Retro Pro complete various projects in our home spread over about one year. 3 complete bathroom updates, kitchen cabinet resurface and two levels of flooring. We also had them replace all windows, exterior doors and interior doors. We had our kitchen done a few years ago and decided it was time to do the bathroom. Retro Pro did a great job on the kitchen, so, it was an easy choice to choose them for the bathroom. They did another excellent job, from helping with the design to the choice of materials. Eric, Steve, Angela, and of course, Omar and his crew are the best. We would not hesitate to use them again or to recommend them to anyone else. Communication between all parties involved with the remodel of our bathroom was outstanding. We are very pleased with the quality of the workmanship as well as the end result. All work was done in a timely manner with no delays. Omar kept us completely informed as to time of arrival, work completed each day, plans for next day, and called us when he was finished for the day if we were not there. All in all, it was a great experience and we are happy we chose Retro Pro to do the job.